On this site you will find Americana, folk art, primitive art, country style graphics of the 1950s and 1960s full of whimsey. Nostalgic 50s and 60s farms, farmhouses, barns, small towns, churches, homesteads, the countryside, and rural landscape scenes. 1950's and 1960's nostalgia featuring automobiles, cars, trucks, motorcycles, tractors. Outdoor scenes with boats, canoes, wildlife, birds, animals, dogs, cats. Whimsical graphic art prints with a 50's and 60's flavor. 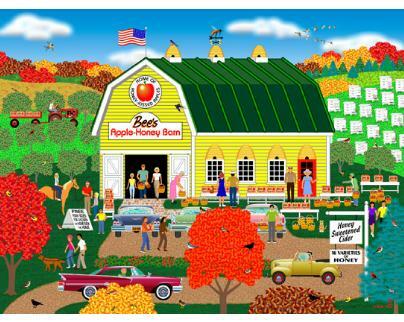 Americana art by Mark Frost is also available on jigsaw puzzles for your family and friends to enjoy!